Research for a better future. Renewable Energy forms one of the pillars for delivering global sustainable environment and the commitment to climate change targets. The renewable energy industry has matured, with huge investments being ploughed into it globally. Global new investment in renewable energy (excluding large hydro-electric projects) was around US$241.6 billion in 2016, with over 138.5GW of added renewable power capacity worldwide. 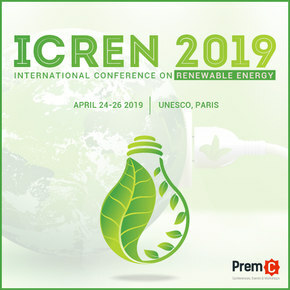 This capacity is equivalent to 55% of all the generating capacity and was approximately double that in fossil fuel generation in 2016. International Conference on Renewable Energy series addresses research and development in renewable energy technologies including energy efficiency. It is an annual meeting planned to be held in a different countries, initially within Europe, with Asia, Middle East, Africa and Latin America being highlighted as target regions for the conference.